After hours on Google we’ve decided to go for the Garmin 60 csx. Thanks to ebay we managed to win (you don’t buy stuff on ebay) a second-hand one for a reasonable price. One of the nice things about the Garmin is that we can set it up to constantly save our coordinates which we’ll then be able to upload to Google Earth. We’ll also be able to sync these coordinates with our photos. 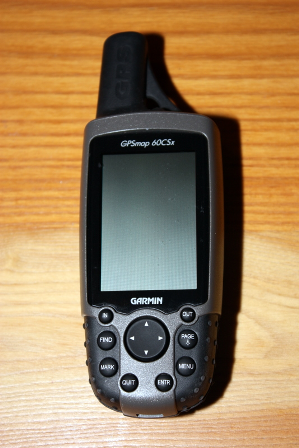 Other useful features include a compass and altimeter, and the ability to plan routes on Google Earth beforehand and upload them to the gps. The Garmin is also waterproof and quite rugged so should be able to survive me not being able to hold something for longer than about 5 minutes without dropping it. We will be using maps from Tracks for Africa. A comprehensive review of the Garmin 60 csx can be found here. This entry was posted in Gear, Navigation by Stoffs. Bookmark the permalink. Chris, if you’re interested I think I still have a bunch of waypoints from our trip. I assume you’ll have a laptop with you and have MapSource installed?